The carry-on bag is one of the essential travel accessories to pack your must-have carry-on essentials during any trip around. For every traveler and tourist, it is must keep one smart carry-on bag to make the journey easy, comfort and hassle-free. There are many categories of carry-ons. But need to play smart to pick the best carry-on luggage for you. You can use small, lightweight luggage, backpack or tote bag as a carry-on bag. For backpackers wheeled tote bag is the comfy one. I mostly prefer smart duffle tote bag as this is multifunctional. And sometimes go with lightweight luggage or take any stylish backpacks along with other luggage. 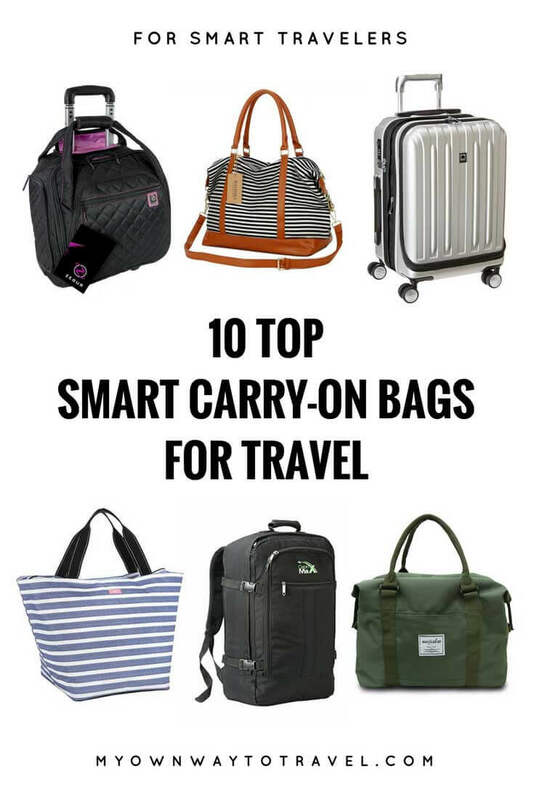 So, here I’m to help you and listing 10 best carry-on bags for travel and intended use. There are many pros of one smart carry-on bag. Moreover, it is not a good practice to keep everything inside one travel bag. You might have lost your luggage or requires much time to search the essential things during airport checking hour. And also during long layover carry-on bag is a must. Moreover, you need to use a carry-on bag to keep your vital travel resources in a manageable way. From travel documents, gadgets to light outfits and beauty kits just perfectly fit inside your carry-on. A carry-on traveler even prefers to travel the world with just a carry-on bag. All in all, it is a time-saving travel gear and helps to travel smart. But as a smart traveler remember not to pack everything in your carry-on bag. 3 Click To Save Your Fave Travel Carry-on Bags! BAOSHA HB-28 Duffel Tote Bag is a multifunctional and smart carry-on for women to use. You can hold your must-have travel products and also 15.6” laptop to travel around. It has a leather shoulder strap, and you can remove that one to use as a tote bag for daily use. And can also use as a shoulder bag or crossbody bag. There is one sleeve on the backside which helps to slide the bag in trolley handle. The carry-on shoulder duffel tote bag is a perfect gear to present as a travel gift to your friends. It can also be a special Mother’s Day gift for your mom. Delsey Spinner Trolley is a best carry-on luggage for men and women. The Helium Titanium International carry-on comes with maximum comfort with the largest capacity and easy access facility. You can keep your every essential travel items, 15.6″ laptop and other electronic accessories in two large compartments of this luggage. There are several pockets to fit your items as well. This expandable spinner trolley is also the recommended one for carry-on travelers those enjoy traveling light. ZEGUR Wheeled Travel Tote Bag is a unisex best carry-on luggage for travel in style. There is plenty of room inside this bag, and you can fully open to pack your travel essentials in an organized way. The rolling underseat carry-on easily fit under airplane seats. Also has lined and exterior pockets to quickly access your travel items. 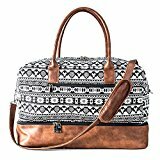 Polare Leather Travel Duffel Luggage Bag is a stylish carry-on bag for travel or enjoys your weekends. The handcrafted design of this 23” luggage will give you a professional look to carry for even any business trip. The weight is 5.73 lbs, but the size is large to hold your travel items and personal belongings. There are adjustable shoulder straps in the bag and inside sleeve is also there to fit your 15.6” laptop. Cabin Max Metz Backpack is a flight approved carry-on bag and perfect for backpackers and carry-on travelers. It has the largest capacity and many compartments and pockets to hold your travel essentials. This carry-on backpack has adjustable side and shoulder straps and handles to carry. This affordable carry-on luggage made of water-resistant materials and available in many colors. SCOUT Weekender Travel Tote is a stylish carry-on bag for women. 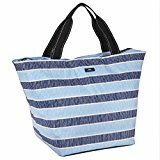 The water-resistant carry-on tote bag made of 100% cotton materials and weight is light. You can easily keep this carry-on bag under airplane seats. It is washable and can use for daily use. There is enough space with inner zipper pouch to hold your travel items and souvenirs. Also available in multiple colors and can be a perfect travel gift for another fellow traveler. 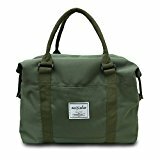 ECOSUSI Unisex Large Travel Weekender is a lightweight smart carry-on bag for travelers. The weight is just 1.4 lbs but has the largest capacity with many pockets to hold your essential travel belongings. It is secure with double top handles. There is one outside pocket on the backside which helps to slide the bag in trolley handle. The long shoulder strap is there to use as a shoulder bag; it is also removable. The carry-on duffle bag is also perfect for daily use when you’re not traveling. It is available in different colors and can be a cute travel gift to present. 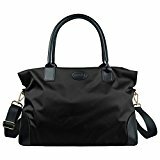 SENLI Handbag Duffle Travel Bag is a waterproof carry-on shoulder bag for travel and daily use. The lightweight, small duffle bag is perfect to carry your travel belongings during any outdoor trips like hiking and camping. It can hold 44.1 lbs of goods. There are also several pockets and available in different colors. The foldable design of this bag helps to carry inside your another luggage or any colorful suitcases to use later. 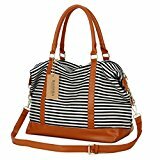 MyMealivos Canvas Weekender Bag is a perfect and smart carry-on duffel bag for female travelers. There is plenty of space with compartments and pockets inside this bag. You can pack your travel essentials and personal belongings in an organized way. One separate compartment is there for shoes but can also keep other travel items. The bag is large, but the weight is light as made by 70% cotton material. Vera Bradley Miller Travel Bag is a lightweight air travel carry-on bag for women. The bohemian style of this tote bag is also a perfect one for a girls weekend getaway and daily use. It has a trolley sleeve and available in multiple colors and patterns. There is enough space with slip pockets to fit your travel items and can also be one stylish travel gift choice. Looking for some more collection of airplane carryon? Check out my Amazon page for the more smart carry-on luggage that suit your budget and style. 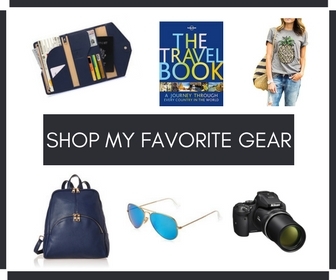 Click To Save Your Fave Travel Carry-on Bags! Are you a carry-on traveler? 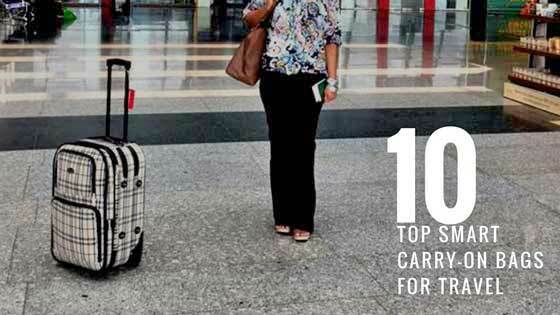 Tell me your pick from the listed 10 best carry-on bags for travel. Carry Max Metz of course! Not the ideal colour though but I love max size cabin bags! Thanks for the info! This is a great selection. Since I am not a fan of handheld bags, I prefer rolling luggage. I like the Delsey luggage. It has a large capacity and spinner wheels so it is easy to maneuver. Yes, large capacity for me the first priority as well while selecting any carry-on bag. it is a good thing that I own three of these bags and use them whenever we travel. thanks for the information. As a long-term traveler, I’m more of a backpack person rather than a suitcase but this list I’m sure would be very handy for people going on shorter trips. The Cabin Max Metz Backpack looks quite interesting though. Cabin Max Metz Backpack is just perfect for the carry-on traveler. I am a fan of backpacks so my choices are always.. backpacks! Being a carry on traveller is tje most convenient and cheapest method of travelling! Thanks for the collection! 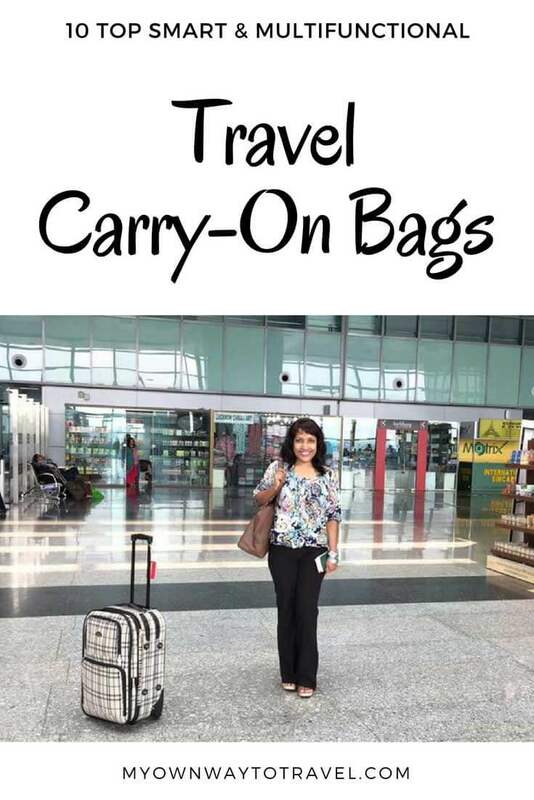 Loved your amazing insights on smart carry on bags, will be bookmarking this post for my future travels as choosing bags is the hell lot of confusion for me. A pleasure to help you out! Wow this is such an impressively comprehensive post! Such great advice for carry on bags for every different need. Thank you! Same here, packing time I always feel the same. Sometimes it’s really not big enough, hehe. Great collection. I always struggle when packing for a trip. My camera and other stuff don’t leave any space in my handbag and carry on bag is most of the time full. I manage to keep every essential thing in my handbag which works as a carry-on. Yes I love carry on whenever I am flying. Great collection and love the variety of these bags shared. This is a great selection of bags. I personally prefer a bag with wheels for when I get tired 🙂 Thanks for sharing this handy list. Oooh some awesome tips here, personally I do prefer a wheelie bag as it is convenient when you have to walk a long way within the airport and 4 wheels is handy because you can wheel it next to you. Definitely saving this for reference. Yes, that’s true. And so many prefer carry-on with wheels! I’ll have the Delsey luggage, please! Great selection of bags. So important to travel with the right gear as it does have an impact in the overall travel experience. Gracias for sharing!